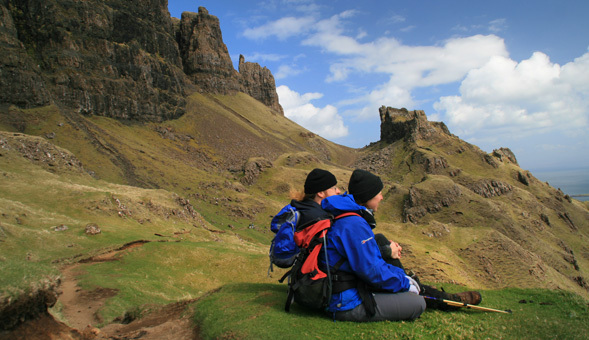 The unique combination of ancient mountain landscape, vast moorlands, vertiginous cliffs, sea stacks and solitude in this part of Sutherland proves a powerful magnet for anyone who loves walking. On this moderate grade holiday we explore this wonderful part of Sutherland. 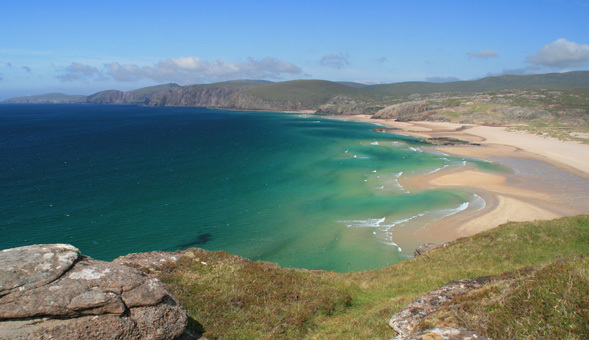 Cape Wrath, Scotland's sparsely populated north-western tip, is wild and unspoilt with views to Orkney, North Rona and west to Lewis from some of Britain's highest cliffs, some reach more than 120m. The remote Cape Wrath lighthouse, built in 1828 by Robert Stevenson stands guard over this remote corner of the north. 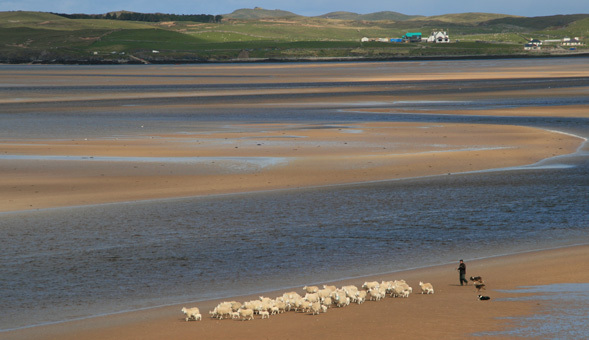 Sandwood Bay is undoubtedly one of the jewels, with its two miles of golden sand, twisted pink and grey rock and the crashing surf of the Atlantic it provides a memorable day's walking. We usually veer off to follow the coast, past the slender sea stack of Am Buachaille ('the herdsman') at the bay's southern end and providing exceptional views of what is undoubtedly one of the finest beaches in Britain. Another day will take us south to Lochinver where we will walk in the shadow of dramatic peak of Suilven to the remote bothy of Suileag. It is easy to see why the Norse gave Suilven the name 'the Pillar'. 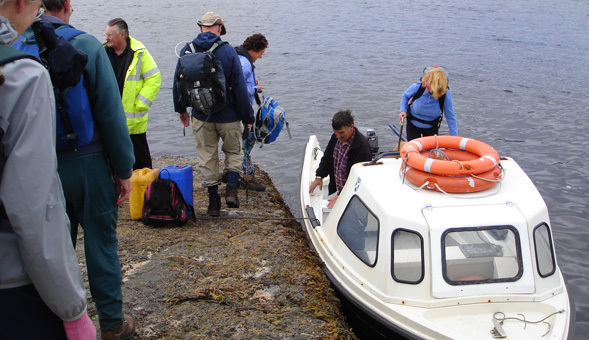 From Scourie we will walk over to Tarbet and take the small ferry to the internationally recognised island of Handa famed for its seabirds. 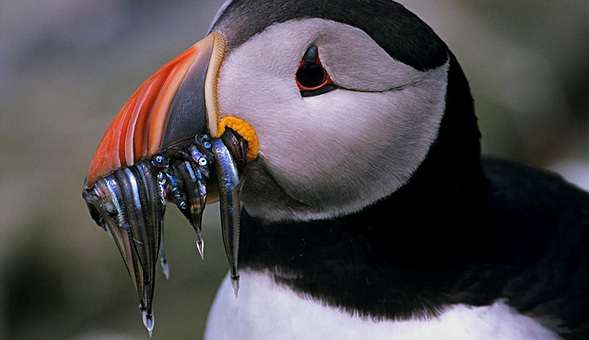 With a little luck we will spot puffin and Artic Skua. Wednesday is usually a free day allowing you to enjoy the pleasant surroundings of the Scourie Hotel. 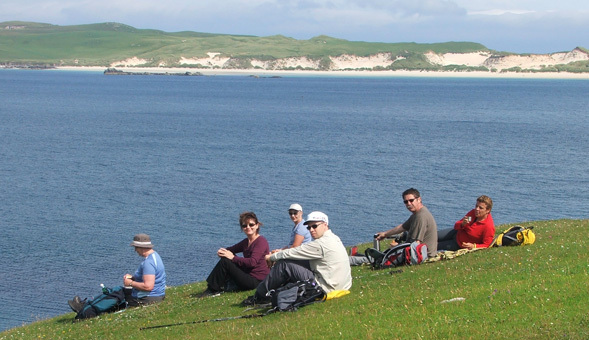 Out final day of the holiday takes us back to the north coast to visit Smoo Cave and climb the small hill of Beinn Ceannabeinne which provides stunning view of the north coast and Loch Eriboll. During the week we stay at the lovely Scourie Hotel, which overlooks the sheltered waters and white sands of Scourie Bay. The accommodation is a traditional fishing hotel and has been our base for many years and we love it. You will experience a high-standard of accommodation and excellent cuisine in a friendly atmosphere. All comfortable bedrooms are en suite. "Very enjoyable, great weather, hotel very good especially the food. Lovely area." "I very much enjoyed staying in the Scourie Hotel. It was friendly and relaxed. The food was good and excellent choice of menu. The grade of holiday was well matched and a good variety of walks." "I enjoyed my holidays so much! The daily plans were well organised and of great interest. Our guide was kind and informative and a great representative of Scotland."